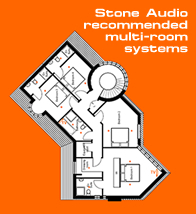 When Proficient started in 2001, they had one goal in mind, to provide audio-video system integrators with everything they need to do home theater, whole house & outdoor sound systems: really great sounding products with rock solid reliability. Four-pair transformer-based on/off speaker selector with volume controls provides quick, convenient access for up to four stereo pairs. 60 watts power handling per channel, rear override switch for circuit protection and suction feet for stable operation. Subwoofers. We love what they do for movies and music but hate the way they look. Proficient has the answer: the IWS85 in-wall subwoofer. The IWS85 mounts flush like an in-wall speaker. How can we get its big 10-inch pulp-fiber woofer to fit in a 3½-inch-deep wall cavity? By moving the powerful neodymium magnet to the front. To power the IWS85, use the M3 subwoofer amp. The M3 goes in your equipment rack and connects with in-wall speaker cable. To get tighter bass and minimize transmission of sound into other rooms, add the BB-IWS10 back box. No matter how you set it up, the IWS85's 36 Hz response and 250-watt power handling ensure you'll get great bass. Subwoofers. We love what they do for movies and music but hate the way they look. Proficient has the answer: the IWS105 in-wall subwoofer. The IWS105 mounts flush like an in-wall speaker. How can we get its big 10-inch pulp-fiber woofer to fit in a 89mm/3½-inch-deep wall cavity? By moving the powerful neodymium magnet to the front. To power the IWS105, use our M3 subwoofer amp. The M3 goes in your equipment rack and connects with in-wall speaker cable. To get tighter bass and minimize transmission of sound into other rooms, add the BB-IWS10 back box. No matter how you set it up, the IWS-10's 36 Hz response and 250-watt power handling ensure you'll get great bass. Subwoofers. We love what they do for movies and music but hate the way they look. Proficient has the answer: the ICS11 in-wall subwoofer. The ICS11 mounts flush like an in-wall speaker. How can we get its big 10-inch pulp-fiber woofer to fit in a 3½-inch-deep wall cavity? By moving the powerful neodymium magnet to the front. To power the ICS11, use our M3 subwoofer amp. The M3 goes in your equipment rack and connects with in-wall speaker cable. To get tighter bass and minimize transmission of sound into other rooms, add the BB-IWS10 back box. No matter how you set it up, the ICS11's 36 Hz response and 250-watt power handling ensure you'll get great bass. Proficient are thrilled with the sound of the CC540. Its graphite 3-inch midrange and 5¼-inch woofers have ultra-stiff cones that deliver incredibly clean and powerful performance, and an especially natural timbre. They placed the 1-inch aluminum tweeter above the midrange driver so the CC540 will disperse sound evenly. Conventional woofer-tweeter-woofer center speakers cannot match this level of performance.